In America's Court is the thoughtful, witty story of labor lawyer Thomas Geoghegan's introduction to the world of criminal law. 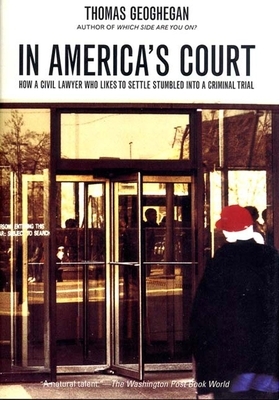 After twenty years of civil practice, in which "complex litigation" fades slowly into settlement, he is unprepared for the much quicker justice of state criminal court when he assists in the defense of a twenty-two-year-old who, at age fifteen, was sentenced to forty years in prison for acting as the unarmed lookout in a botched holdup. In an America that now routinely imprisons kids as adults, he comes to see this small case as a basic test of human rights. The case leads Geoghegan to reevaluate his own career as a civil lawyer and the ways he might use the law to effect social change. Written with the author's trademark intelligence and humor, In America's Court is a compelling narrative and a candid look at the justice that our society provides for its citizens. Thomas Geoghegan is a practicing attorney and the author of several books, including In America's Court: How a Civil Lawyer Who Likes to Settle Stumbled into a Criminal Trial, the National Book Critics Circle Award finalist Which Side Are You On? : Trying to Be for Labor When It's Flat on Its Back, See You in Court: How the Right Made America a Lawsuit Nation, and Were You Born on the Wrong Continent? : How the European Model Can Help You Get a Life, all published by The New Press. He has written for The Nation, the New York Times, and Harper's. He lives in Chicago.